iOS 9 is finally here and with it the iPad has many changes to the look & feel, animations as well as its functionality. 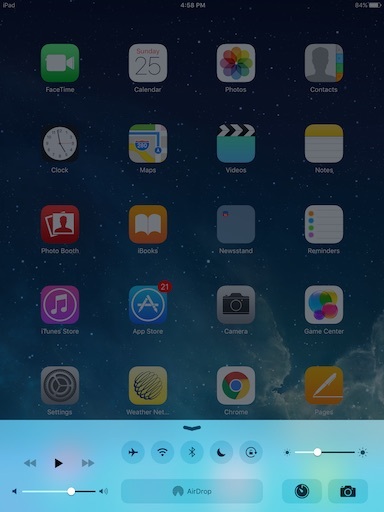 In this article, I will discuss the usage of Control Center. Please note that Control Center has been available since iOS 7 and is also available on iOS 8 and 9. Control Center can be described as a shortcut to some of the most frequently used features on the iPad, iPhone or iPod touch. Depending on the version of the hardware that you are using (iPad 2, iPad 3, iPad 4, iPhone 5, iPad Air, iPad Air 2, iPad Pro) you will see some differences on the Control Center buttons and sliders. The shortcuts come very handy when you want to quickly take a picture, enable/disable Bluetooth or access the Wi-Fi without having to go through the Settings menu. Tap on the bottom of the screen and swipe up with one finger. The following screenshot highlights the Control Center icons and provides a quick hint about what they represent. Airplane Mode turns off Cellular, Wi-Fi, Bluetooth, GPS and Location Services on your iPad. If your airline allows it, you can turn Wi-Fi or Bluetooth back on, even while in Airplane Mode. While in this mode you can still listen to music, play games, watch videos, or use other apps that don’t require Internet access. Turns the Wi-Fi signal on and off. This shortcut connects you to known Wi-Fi networks (networks you have previously connected to and that you already entered a password). This is ideal for example when turning Wi-Fi on and off at home or at the office without having to open the Settings >> Wi-Fi menu. Turns the Bluetooth signal on and off. When Bluetooth is on, you can pair your iPad with Bluetooth devices such as headphones, keyboard, etc. Keeps alerts and notifications from making any noises or lighting up the iPad screen when the screen is locked. It is an easy way to silence the iPad, while you are having dinner or you are sleeping. This icon lets you quickly lock the screen orientation (landscape or portrait). 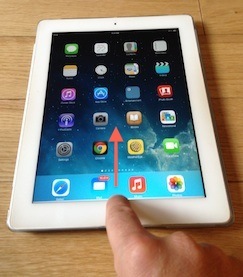 Orientation Lock complements the iPad Side Switch and can be configured to function as Mute instead. You can control the music (play, pause, previous, next) that is being played as well as the volume. This is a shortcut to the Timer feature within the Clock App. This is a shortcut to the Camera App. 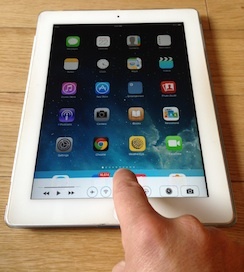 The slider lets you adjust the Brightness on your iPad screen. AirDrop lets you share your pictures, videos, links and other items wirelessly with other iOS 7/8/9 devices that are nearby and that support AirDrop. This feature transfers the information using Wi-Fi and Bluetooth. AirDrop is available on iPad (4th generation), iPad Air, iPad Air 2, iPad Pro, iPad mini, iPhone 5 or later, and iPod touch (5th and 6th generation) and requires an iCloud account. Download a Control Center quick guide here! Note: This post was originally written for iOS 7 and recently updated for iOS 9.